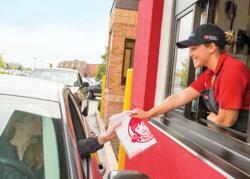 QSR Magazine quoted in The Wall Street Journal recently evaluated drive-thru service at 10 chain restaurants. Burger King took top place with speed in executing orders taking on average 193 seconds. McDonald’s in comparison was slower at 273 seconds. In determining the accuracy of orders, Chick-fil-A® achieved 97.3 percent accuracy followed closely by Arby’s at 95.2 and McDonalds at 92.9. Hardee’s, Taco Bell and Burger King were all above 90 percent. KFC was the laggard in the group with only 69.9 percent accuracy in fulfilling drive-thru orders denoting deficiencies in systems or training.